October 2008: Previously, I had mentioned that some external forces caused me, your humble chronicler, to lose track of the Galaxy's Greatest Comic for a couple of months. When I started paying attention again, I could not, for the life of me, make any sense of The ABC Warriors. At this point, we're deep into "The Volgan War," which is four separate 72-page stories, each of which is serialized as ten or twelve episodes. Now, one of many things that Matt Smith has got very right in his time as Tharg has been making sure that stories run without a deadline break between episodes. This has mainly been a thing of the past, but the third chunk of "The Volgan War" is one of those unfortunate and very rare exceptions. It runs for six weeks, takes a break for four, and returns for the last six. Worse, it's with episode six that the action shifts to explain what's been going on with the new character of Zippo. Okay, so in the previous chapter, I acknowledged that part of why I had no clue what was going on in ABC Warriors was because I just didn't care to read 2000 AD for a couple of months after the Stalag 666 incident. I'll even take 95% of the blame. But the rest is because Pat Mills has gone completely loopy with this story, and, for weeks, it's like a fever dream. There aren't even any ABC Warriors in it. This is absolutely an occasion where Mills' desire to write for the eventual book - or, in the case of "The Volgan War," four of the darn things instead of one big, fat phonebook - just doesn't do the weekly episodes well at all. Mills is actually having a rough time of it in the prog. Around this time, he also has a four-part Judge Dredd story called "Birthday Boy." It's actually one of his very best scripts for the character, and a perfectly fine adventure, and it is completely ruined by the slack, uninvolved, thrill-sucking artwork by Vince Locke. He is a fine artist by any definition, and I believe we can credit him with some excellent episodes of Vertigo's Sandman Mystery Theatre, but this story is such a disaster that it is best forgotten. 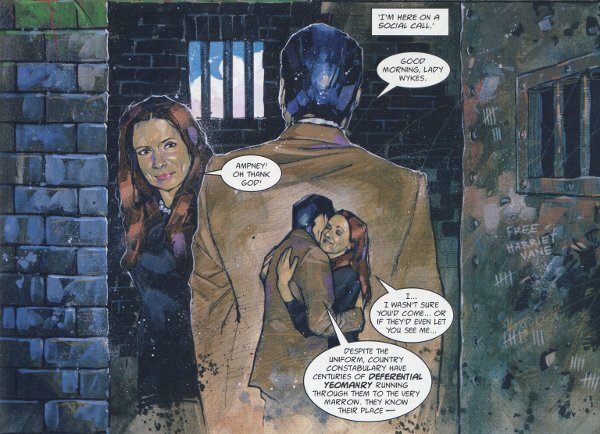 So this brings us to Ampney Crucis Investigates, an often very good series by Ian Edginton and Simon Davis that keeps feeling just a hair shy of being one of the all-time 2000 AD greats. It debuts in prog 1611 with a corker of a first episode. It's 1928, and a beautiful woman, Lady Calliope Wykes, kills her husband, who has transformed into a hideous insect creature. Meanwhile, Lord Ampney Crucis, youngest son of Lady Zuleika, awakens from a terrible nightmare. He is haunted by an incident at the Somme, twelve years previously, where he witnessed a hideous Cthulu-like beast dismembering and slaughtering soldiers. He's met by his manservant Cromwell and the game is afoot. The apparent pitch for Crucis is "Lord Peter Wimsey as written by Lovecraft," meaning it's 50% guaranteed to catch my eye. I really, really love Dorothy L. Sayers' stories of Wimsey and his wonderful family! Unfortunately, I have no interest at all in Lovecraft's turgid prose or ideas, but I like Sayers enough for it not to matter too much. Major Wimsey returned from the Great War so badly shellshocked by the stress of ordering men to their deaths that he was invalided. Lord Crucis - I am not quite clear on the peerage etiquette here; Lord Peter explained in the novel Whose Body? that as he has an older brother, Gerald, he should not be referred to as "Lord Wimsey," but Ampney, who has at least two older siblings, goes by "Lord Crucis" - came back driven mad by the sight of the worm-beast. Both characters wear monocles as affectations and both had a fiancee call off the wedding as a result of their war experience, and then both began amateur investigations, only Lord Crucis focuses on cases with an occult aspect. Ampney Crucis Investigates is achingly close to being one of my all-time favorites, but so many little things work against it. You can almost sense a little hesitation from Tharg in the short little run of the first story, "Vile Bodies." (You'll note, of course, that Lord Crucis's first recorded adventure recalls the name of Lord Peter's.) It's a case that would really benefit from many more pages for the character to, you know, investigate things. It feels like Tharg has just given it a short six-week slot at the end of the year, to burn it away, not really certain that readers, other than me, are all that interested in posh upper-class detectives from the throwback days of the 1920s, no matter how many Cthulus and bee-monsters are stuck in the story. The result is a pilot that moves at the requisite rocket fuel pace, but it leaves a hell of a lot behind. Lord Crucis and Cromwell actually have a third member of their party, a chauffeur named Lorelli, who appears in only one panel of this story, and hardly at all in the subsequent adventures. The main character additionally received a stunning second injury when he met the Cthulu-thing in France: it tore his feet off. But this isn't mentioned anywhere, and only shown in passing in the second story, which would appear in 2010. 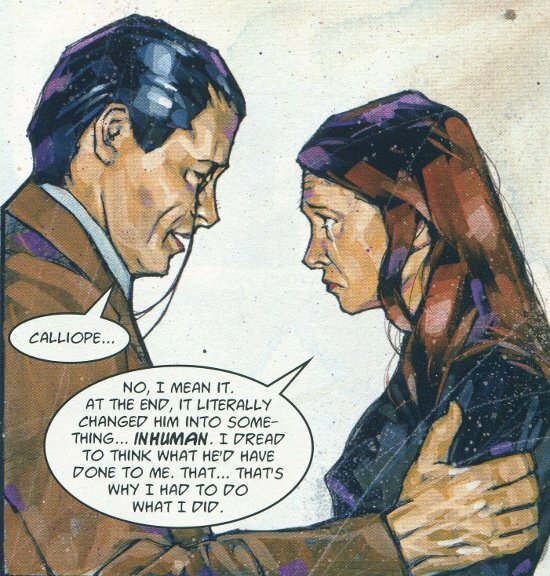 One of the original plans for the character, as seen in the Simon Davis sketches that appear in this story's collected edition, was for him to have both artificial hands and feet, but only the wooden feet remained when the series began. There's just no space for the characters to breathe with so much plot compacted into so few pages. But worse, the plot of the first story, at least, barely leaves Lord Crucis with anything to investigate, let alone deduce. This isn't detective fiction as I enjoy it; it's just a very simplistic adventure story with a monocle-wearing lead. It is a fine distraction, and gorgeously drawn, but there's just no meat to chew on. Lord Crucis doesn't work as well as an action hero as Edginton seems to wish for him to. Here, he follows exactly the same very short path of clues that even the thickest village constable should have followed, and, in the end, is rescued by a risible "old school chum" working for the government and whose climactic reappearance in the narrative is telegraphed from a mile off. Over the course of a labyrinthine 13-week story with dead ends, more characters, and many more corpses, I expect that the "Vile Bodies" that might have been, would have been a huge triumph. I enjoyed the second and third Ampney Crucis Investigates stories somewhat more, albeit with reservations, although the all-action weirdness of the fourth story, now thrown into a parallel universe and bringing our hero into two-fisted conflict with some of those otherworldly horrors, was a massive letdown. The fifth story will begin in just one week, in Prog 2013. I have my fingers crossed for it; this is a series that I want so badly to embrace, but the darn thing keeps frustrating me. But that's still many more chapters away. In the next installment of Thrillpowered Thursday, we'll look at Prog 2009, The Red Seas and Marauder. That'll be in January, after a few weeks of recharging, and reviewing some other House of Tharg goodies over at my Bookshelf blog. Thanks for reading, everybody! You're so right about Ampney Crucis there's just not enough investigating, and that for me is the draw of this kind of series. 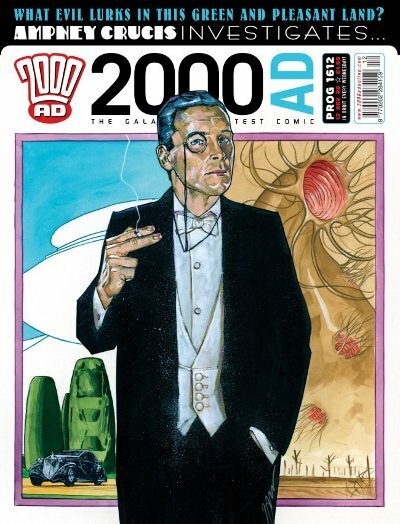 Now that 2000AD is basically the only comic on the shelves in the UK, does everything in it have to be sci-fi/fantasy/horror? Might write in to Tharg about that.